Mobile access is the use of a mobile device (e.g. smartphone, tablet or wearable) to gain access to secured doors, gates, networks, services and more. Our solutions allow organizations to meet the growing demands of a mobile-first world. Operational Efficiency and Cost Effectiveness: Using HID Global’s highly stable online management portal, administrators can create, manage, issue and revoke credentials through the cloud. With the option for subscription billing, customers enjoy a more predictable cost as user licenses can be added or removed. This enables organizations to efficiently scale up or down in response to their business needs. Higher Security: HID Mobile Access is delivered through a highly secure and reliable cloud platform that is backed with a service level agreement of at least 99.5% service availability, demonstrating HID Global’s commitment for uptime and connectivity. Even more, the solution is powered by Seos credential technology and follows best practices in data integrity to bind each mobile ID to the device and protect the data at rest and in motion. iCLASS SE® & multiCLASS SE® mobile-enabled readers offer a consistent user experience across different devices and operating systems. The same quality access control you have come to expect from HID Global, all in the form of a phone. Click or hover over each component for details of the solution. 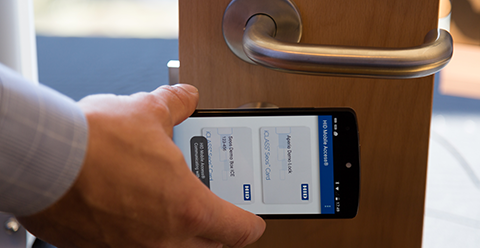 HID Mobile Access merges security with convenience by enabling a smartphone to unlock doors and enter buildings. Our case studies have shown this to be a safe, easy to use solution. 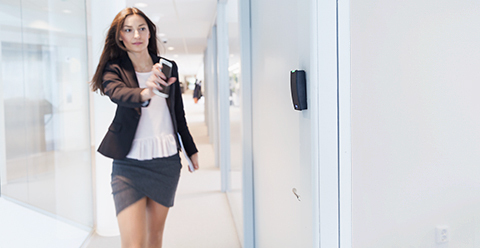 This solution really represents technology at its best, and the next step in security and convenience for access control." Field Project Manager, RFI Enterprises, Inc. Need Customization or Integration Assistance? Our industry-leading experts can customize end-to-end solution implementation for you and maximize the strategic value of your Mobile Access investment. Partners can leverage Mobile Access to integrate their Physical Access Control System (PACS) with our cloud services and/or to create their own mobile applications to merge security and convenience.